Blend a sophisticated urban center with a quiet, convenient residential village. The result is The Courtyards at City Place. This collection of chic townhomes offers you versatile floor plans to suit any lifestyle, with lush open space, and all the dining and entertainment possibilities one could ask for. It's all waiting at The Courtyards. Once, people lived this way: nestled in stylish city flats centered on a common garden or court. There, adults would meet and chat, kids and pets would play, and plans might be made for a picnic or a dinner party. Local restaurants and markets were steps away. The Courtyards at City Place returns to that era with a new level of quality and beauty. Spacious designer townhomes feature the latest leading-edge amenities. 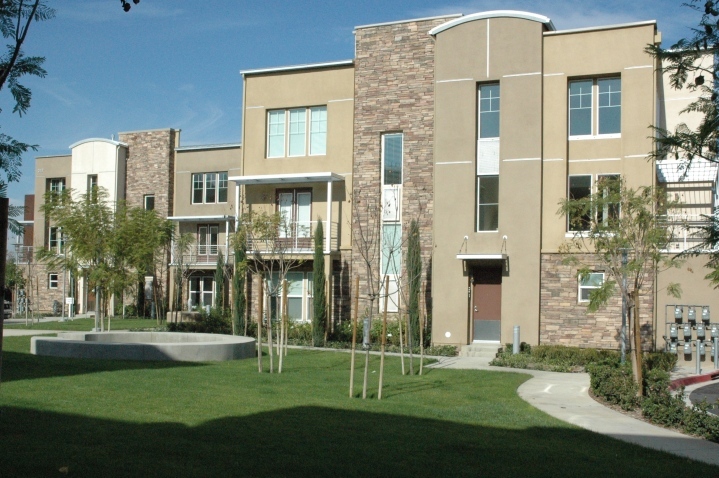 Landscaped center gardens and fountain courts offer a peaceful retreat. Meandering paths lead to City Place's district of cafes and boutiques, music and street life. it's an earlier way of living... with an unmistakable modern attitude. The amenities of City Place are always a short stroll away. Slip on your walking shoes and enjoy the sunshine as you head for dinner or a movie. Quality and attention to detail are visible in The Courtyards. The curves and lines please the eye, invite in light, and recall classic urban townhouses from a bygone era. The materials, from natural stone to gleaming metals, speak volumes about craftsmanship. These are homes you can take pride in. With seven floor plans, The Courtyards has potential only limited by your imagination. Turn a loft into a home office and turn downtime into productive time. Use furnishings and design to create an open space perfect for entertaining. Take in the sun or starts on your private deck. Or end the day with a walk to Santa Ana's nearby jewel, Santiago Park. This is urban living the way you've always envisioned it. What car culture? City Place is the anti-suburb. An innovative urban enclave in the heart of Santa Ana, City Place is built for a new kind of lifestyle: pedestrian-friendly, relaxed, vital and stimulating. Everything you need, from fine dining to entertainment, just a few steps from your door. City Place frees you to work your own way, live at your own pace, create your own style. City Place puts you at the center of the action. The 5, 22 and 55 freeways are minutes away. Westfield Shopping Town MainPlace is across the street. Hospitals and healthcare are nearby. Everything you need is close at hand. 3 Properties Found. Page 1 of 1. This can be common with unique types of real estate. Orange County Lofts has meticulously collected floor plans, images, video tours and more so we're able to help you search for the right type of property even when the property you want isn't publicly available. Once we determine which types of properties you like most, Orange County Lofts will actively draw from its network and contact property owners that are on the fence and thinking about selling to try and arrange an off-market sale. If you're interested, please get started by emailing us today. Based on information from California Regional Multiple Listing Service, Inc. as of March 6th, 2019 at 5:36pm PST. This information is for your personal, non-commercial use and may not be used for any purpose other than to identify prospective properties you may be interested in purchasing. Display of MLS data is usually deemed reliable but is NOT guaranteed accurate by the MLS. Buyers are responsible for verifying the accuracy of all information and should investigate the data themselves or retain appropriate professionals. Information from sources other than the Listing Agent may have been included in the MLS data. Unless otherwise specified in writing, Broker/Agent has not and will not verify any information obtained from other sources. The Broker/Agent providing the information contained herein may or may not have been the Listing and/or Selling Agent.